Derek Tan, on a botany foray. 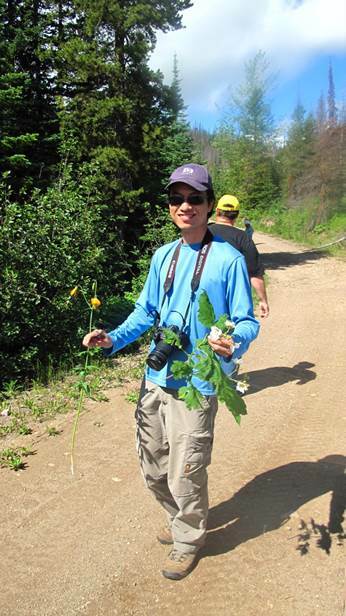 The Beaty Biodiversity Museum is proud to announce that our own Digital Media Specialist Derek Tan is one of this year’s recipients for the President’s Service Award. Derek constantly performs his duties with a high degree of dedication and commitment, supporting every area of the museum from our educational team, to our membership events, to museum outreach initiatives. His collaborative approach and commitment to education and outreach comes across in every project in which he is involved. Every time the museum embarks on a new project, Derek’s contributions to digital and print design are crucial to implementation. The Beaty Biodiversity Museum and all of its staff heartily support the decision to award Derek with the Creativity & Innovation Service Award! Congratulations!